Businesses across the state of New Jersey rely on commercial garage doors to operate at peak performance and secure their staff and resources. From warehouses to firehouses and repair shops to delivery companies, they all need the ease and dependability that comes with a large commercial-grade garage door. But which type is best for your business? Are you considering the benefits of a roll-up door vs an overhead door? When it comes to the finer details, it can be challenging to know which style of door will suit your needs and facility. At TGS, we are happy to assist, with a range of doors, openers, and hardware designed for heavy-duty applications. Many businesses use roll-up or other commercial style garage doors on a day-to-day basis. If your business is retail, you may have deliveries that come in through a secure back roll-up door. As the manager of a vendor or supply warehouse, you may understand that loading items on the truck quickly is much simpler with the right type of garage door. Of course, firehouses and repair shops use commercial grade garage doors as do some car washes, oil change facilities, and parking garages. In fact, a commercial garage door can be a benefit in just about any industry. Getting the right one to fit your needs is important. Here’s a closer look at the different styles of garage doors that serve the commercial sector. As its name suggests, these garage doors coil into a roll as the door lifts, allowing for a compact result. Because they roll into a coil versus lie horizontally with the ceiling like overhead doors do, they are ideal for facilities that don’t have very much overhead space available or which don’t have the place for a garage door track. Though they tend to be constructed of thinner slats than a regular garage door, customers can choose from a variety of material types to ensure they have the durability they require. Overhead doors are commercial-grade doors that function as the average residential garage door. Essentially, the door rests on a track and moves upward when opening until it is horizontal with the ceiling. 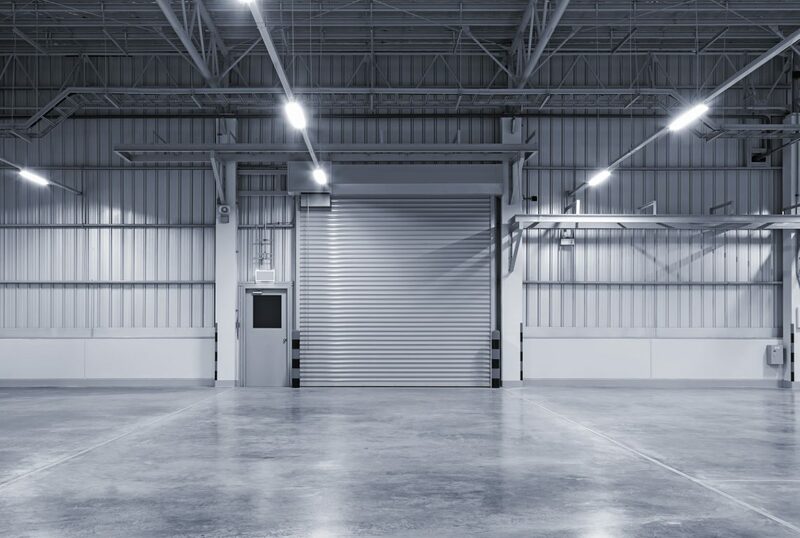 Our commercial-grade overhead doors are durable and designed to withstand heavy usage, perfect for those with the overhead space. Fire doors operate like roll-up doors but are constructed with materials that are more resistant to damage, including fire-resistant steel. These doors provide a noise-free environment as well as have more insulation making them popular in warehouse settings, parking garages, and other industrial facilities. Rather than a completely solid door of material, grilles and closures provide varying levels of ventilation and visibility, and are often seen in retail settings where visuals are important. The grate-like design of these doors makes them a preferred option for those who do not want to sacrifice air circulation (as might a retailer in a food court) or visual appeal (as might a clothing store at the mall). These types of doors are easy operating, making them ideal for lighter-duty use, while still providing the security that is needed. When businesses choose to work with TGS Garages & Doors, they gain access to a team with years of experience, qualified to help you make the best decision for your operation and facility. Learn more about our commerical services and contact us to set up a consultation.